Although we have become more aware of the damage humans are doing to the environment, the impact on our lives is just beginning. Rising sea levels seem like a distant threat, but other factors are more imminent. We can read about depletion of aquifers, creeping desertification in China and Africa, loss of farmland to industry and roads which seem abstract, but anyone who has shopped for bread or flower or rice in the last few year knows that the price has risen dramatically. The law of supply and demand tells us without question that resources are getting more scarce. We are doing a good job of developing technology to extract and refine poorer grades of ore, oil from deeper under the ocean, and divert water from more distant rivers, but there are limitations, and all of these “fixes” add cost to the process which leads to higher cost to the consumer. This higher cost must invariably lead to a reduction in our ability to consume and if we do not act, in our quality of life. We have lived for years with the illusion that new technologies will be developed to solve the problem of diminishing resources and energy. As oil prices rise, we have blind faith in the ability to convert the economy to renewable sources of energy. The disastrous push to use corn for automobile fuel illustrates the problem of diminishing returns on energy and capital. In the early days of the industrial revolution, oil was easily found and for every gallon of fuel expended in finding and drilling for oil 100 gallons could be recovered. Ethanol was barely a break even proposition as we now know, returning only one gallon of fuel for a gallon consumed in growing the corn shipping and processing. Other “solutions” also have limited returns. Photovoltaics require rare elements and significant amounts of energy to manufacture them. Richard Heinberg in Searching For A Miracle, rates the EROEI (energy return on energy invested) as between 3.75:1 and 10:1 Wind power is better at close to 20:1, but in either case nowhere near the 100:1 ratio that allowed for the massive build out of infrastructure that we now take for granted. Economics will force us to become more efficient, waste less, use less and control population growth or it will happen on its own, most likely with harsher consequences. We are left with only one option: to reduce our resource use. Many groups are working toward this goal by promoting locally grown food, increased efficiency in automobiles, houses and appliances. Very few have actually struck at the core of the issue which is the dependency of our economy on continued economic growth as well as population growth. Herman Daly proposed the unsustainability of the growth model in his seminal book Beyond Growth. GDP is an excellent indicator of resource consumption. 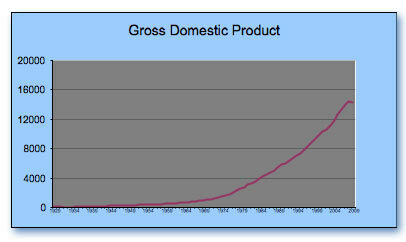 Since 1929 GDP has increased 138 fold. Growth will peak, the question is what will the graph look like after the peak. Will we be able to maintain a reasonable level of comfort? Daly shows that we need to make fundamental changes in our economic structure to value resources at their real worth in the eco-system. One potent means of rewarding the conservation of resources would be to fundamentally change the tax structure to eliminate the income tax and establish a resource tax. Currently by taxing income, we encourage the substitution of resources (fuel and machinery) for labor. We need to reverse that subsidy.